A rural landscape submerged under water. 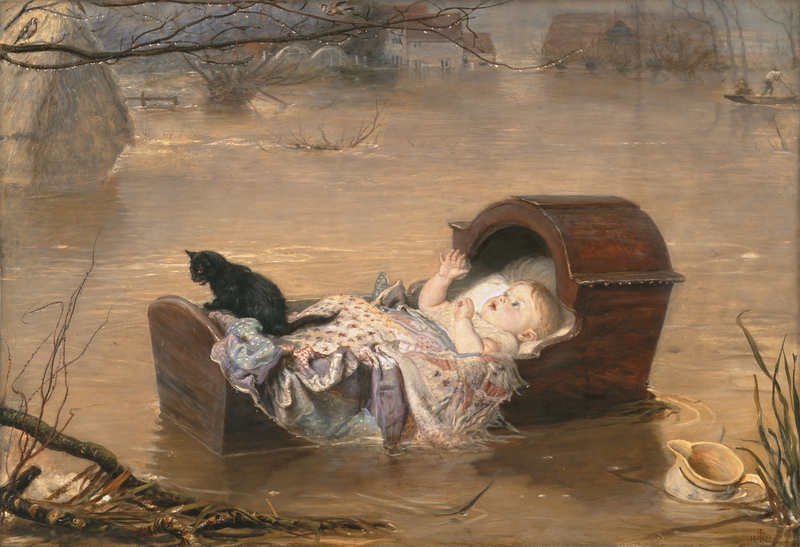 In the foreground is a baby in its wooden cradle, carried away by the flood. It appears oblivious to its apparent danger and mesmerized by the glistening droplets of water hanging from the branch of a tree overhead and the small birds sheltering there. Sitting on the baby’s floral patchwork coverlet, and peering over the end of the cradle is a black kitten, terrified by its situation and mewing for help. Floating between the head of the cradle and a clump of rushes is a jug. To the left of the composition is a partially submerged haystack, beyond which is a farm house and outbuildings. In the background to the right, a man and woman punt in the direction of the baby across the watery landscape. A Flood 1870 Sir John Millais 1829-1896 Oil on canvas A flood in Sheffield in 1864 was the immediate inspiration for this painting. Local newspapers reported that a child in its cradle had been washed out of a house. But the picture is not simply a record of that flood. It also belongs to a tradition of paintings showing babies in cradles - not least, illustrations of the story of Moses. The recent floods in Britain, attributed to the effects of global warming, give this painting a new topicality.